Corporate Social Responsibility is an essential obligation of the business community and part of the personal ethos of the Kuitwaard family. As a local, family-owned business, Metropolitan Food Service takes tremendous pride in the positive contributions we have made to the communities in which we operate since our inception in 1983. In keeping with our core values, MFS is committed to expanding the ways in which we are able to positively impact our communities and the wider global community – through contributions to our local economy, environmental stewardship and continued investment in the human capital of our employees. Metropolitan Food Service has operated as a local family owned and operated company for more than twenty five years. When customers purchase food at one of our campus locations, their dollars are reinvested back into the local economy, helping to grow and sustain it. IN GENERAL, FOR EVERY $1 SPENT AT A LOCALLY OWNED BUSINESS, THE LOCAL ECONOMY RECEIVES $3 IN TERMS OF INCOME, JOBS, TAX BENEFITS AND COMMUNITY/ PHILANTHROPIC CONTRIBUTIONS. We have demonstrated our longstanding commitment to investing in and growing our local economy by cultivating relationships with vendors, distributors and producers within our communities, sourcing food locally whenever possible and recruiting and hiring employees from the communities in which we operate. 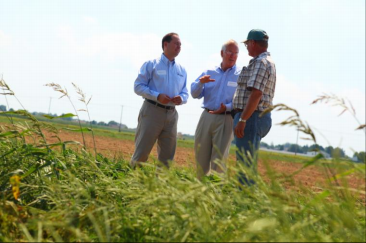 In working with these local companies, which supply hundreds of farming, manufacturing, delivery and administrative jobs, Metropolitan Food Service helps to ensure jobs, provide stability to the local economy and preserve quality of life for many local people. Using the freshest possible ingredients in the meals that we create has always been a priority at Metropolitan Food Service. Our policy of utilizing locally produced specialty foods and locally grown produce in season ensures that we are supporting local farmers, vendors and distributors, and helping to sustain the local economy. At the same time, Metropolitan Food Service is committed to reducing our carbon footprint by procuring food that has traveled many fewer miles to arrive on the plates of our customers. We define sustainable products as those products which employ farming and rearing methods designed to have a reduced impact on the environment, and which travel a minimal distance to arrive at our facilities. One of Metropolitan Food Service’s first ventures into food service sustainability was a partnership with our food service purveyors designed to increase our purchasing of locally grown, seasonal, and organic produce. 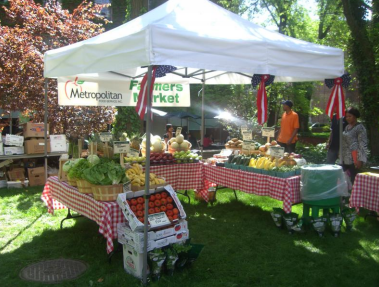 Each Semester Metropolitan Food Service Inc. and our partners at J. Kings food service distributors along with the New York State Department of Agriculture and Markets hold an open-air farmers market on each of the college campuses that we serve. 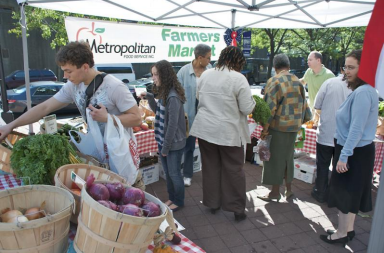 The Farmers Markets feature fresh fruits and vegetables from a wide variety of farms throughout our regions. We also take this opportunity to highlight fresh locally prepared foods and beverages from organizations like Red Jacket Orchards from Upstate NY. All of the Farmers Markets we have held have been a huge hit with not only the students but the entire campus community. Our customers love the idea of knowing the produce they are buying is fresh and sourced locally. Metropolitan Food Service is proud to be an integral part of the vibrant academic and cultural communities at the Colleges in which we operate. In keeping with the stated pro-social and sustainability aspirations of City College, Metropolitan Food Service strives to make a positive social impact by contributing to and interacting with organizations providing critical services to the citizens of the communities in which we operate, and enhancing the culture and experience of the City College Community through increasingly sustainable and community oriented practices in food service. The Food Service Director and our Management Team at City College will work very hard to minimize the amount of food that is discarded through careful preparation protocol, meticulous tracking of daily and weekly sales and strict inventory management. However, it is inevitable that some percentage of the prepared food and raw ingredients will remain unused beyond the internal freshness protocol that we employ in our kitchens. Metropolitan Food Service is working in partnership with City Harvest www.CityHarvest.org to donate as much of this unutilized food as possible to organizations delivering nutritious food to those in need throughout the metro area. We are also in the process of exploring partnerships with Community Pantries and Soup Kitchens in Bedford Park or the surrounding neighborhoods to which we may also be able to donate nutritious prepared foods and meals. 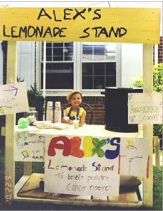 Beginning in 2007 Metropolitan Food Service has worked in partnership with the non-profit Alex’s Lemonade Stand to raise money for pediatric cancer research. With the generous donations from campuses on which we operate, Metropolitan Food Service has been able to contribute to the goal of the Foundation’s founder Alexandra Scott, to raise money and awareness of childhood cancer causes, and fund research into new treatments and cures. Metropolitan Food Service looks forward to continuing this tradition every spring, and to partnering with other equally inspiring organizations in future initiatives. The following are additional sustainability programs that Metropolitan Food Service strives to implement in furtherance of our goal of making a positive social impact on the communities in which we operate, and the wider global community. We strive to reduce and even eliminate where possible, the net solid waste that is transported to landfills on a weekly basis, by investing in creative ways to utilize and repurpose our waste. Composting has become a widely utilized alternative way to dispose of the waste component of food preparation. Metropolitan Food Service is currently investigating a partnership with the New York City Compost Project www.nyccompost.org to develop a composting program, using food waste from the kitchens on the City College campus as a resource to create nutrient-rich composted soil for use in community gardens city-wide. It is a company-wide goal to increase the percentage of sustainable and post-consumer recycled materials used in our facilities and operations. Since 2005, Metropolitan Food Service has increased the volume of post-consumer waste recycled on our campuses through strict adherence to a recycling program in our offices and facilities. In addition, we have implemented a collection program in our dining facilities to reduce the number of aluminum cans and plastic bottles entering the waste stream. Metropolitan Food Service has implemented a policy of using copy paper with recycled content in our administrative offices. We also plan to further reduce our net use of printed paper and increase our use of recycled content paper in our administrative and operational capacities. By posting weekly and catering menus, and other valuable information on the City College Food Service website, we hope to decrease the amount of printed paper generated as a result of our daily operations. Metropolitan Food Service is dedicated to reducing the number of disposable cups used daily in our food service operations. We currently offer reusable mugs for sale at our company’s cost in an effort to encourage customers to buy and use these more environmentally sound reusable products as frequently as possible. Customers are already taking advantage of this initiative however we plan to expand the program by encouraging and providing additional incentives to customers who bring their own reusable cups. Each student purchasing a mug will also receive a free beverage with their initial purchase. Then, to encourage continued use, we will offer refills at a lower price to continue to promote the usage of the mugs. This program has been successfully implemented by Metropolitan Food Service Inc. on other campuses. Participation and customer feedback have both been very positive, so we expect the City College initiative be quite popular and successful once implemented. We also plan to increase the variety of reusable items for sale to increase the appeal of the program. Our employees are the heart and soul of our organization. The safety and security of our employees, and the comfort that they feel in their work environment is directly reflected in their dedication to providing our customers with delicious food and excellent service. It is our belief that employees who are engaged, challenged and respected in their work environment are also more productive and effective. We strive to create that environment for our employees and are continually seeking out ways keep our employees connected. Food Service is an industry in which there is typically a very high rate of employee turnover, however data from a recent company-wide Employee Survey has revealed that 90% of our current employees have been with Metropolitan Food Service for more than a year, and nearly half have been with the company two or more years – that’s commitment! The majority of our employees feel like they are treated with respect by their managers, are recognized for their individual strengths and are provided with constructive suggestions on how to better perform in their roles. In a world where many people feel like there is an increasing imbalance between work and family responsibilities, the majority of our employees feel that Metropolitan Food Service is flexible with respect to work hours and family responsibilities, that management understands the importance of balancing work and family life, and that management is sensitive to employee problems. Metropolitan Food Service employees at are overwhelmingly satisfied in their positions, and feel that their compensation is commensurate with experience. Nearly 95% of our employees feel that Metropolitan Food Service is an excellent company to work for and would recommend employment with our company to a friend or family member. We are proud of the loyalty and dedication of our employees. The eager and honest response to our survey, and the valuable input and guidance that our employees provided us with has inspired us to search for ways to make additional investment in our employees. NEARLY 95% OF OUR EMPLOYEES FEEL THAT METROPOLITAN FOOD SERVICE IS AN EXCELLENT COMPANY TO WORK FOR AND WOULD RECOMMEND EMPLOYMENT WITH OUR COMPANY TO A FRIEND OR FAMILY MEMBER. Metropolitan Food Service Employees undergo rigorous training in food safety and sanitary food handling techniques, and must complete a comprehensive cross training program which covers both the Front of the House and Back of the House responsibilities. In addition to these compulsory training sessions, Metropolitan Food Service is committed to sponsoring a new Continuing Education Program dedicated to investing in the personal and professional development of our employees. We are interested in taking advantage of the excellent educational opportunities available at City College for the benefit of our employees.